Dubbed “The BEARLs,” the event is sponsored by UC San Diego’s Warren College, and the name is a combination of Tim Hawkinson’s famous “Bear” outdoor sculpture, located on the Warren campus, and “Earl” Warren, the college’s namesake. Hollywood glamour may not be synonymous with humanitarian work, but it is at the University of California San Diego where every year, the campus honors individuals who have positively impacted their community with an Oscars-style ceremony. On April 9, UC San Diego’s Earl Warren College will be rolling out the red carpet for its annual “BEARLs,” to honor those who exemplify the UC San Diego Principles of Community, which were developed two decades ago to foster a campus culture of inclusivity and collaboration. A total of five members of the campus community, along with a distinguished alumnus and a special celebrity guest will be awarded for their positive contributions to society at the event. This year’s celebrity awardee is Jodi Kodesh, a meteorologist who delivered the weather on NBC 7 in San Diego for nearly a decade. Her passion for promoting girls in STEM (science, technology, engineering and math) has taken her to elementary schools across the country. Kodesh received an Emmy Award for her weather coverage of President Ford’s funeral in Rancho Mirage and was nominated for a second Emmy following her work on an education special about El Nino. The alumni awardee, Keita Funakawa, is a scientifically minded artist who has combined his interests in technology and art when he co-founded Nanome, a software company that uses virtual reality (VR) technology to benefit STEM learning and scientific innovation. Nanome pushes disease and scientific research as well as a pharmaceutical drug discovery forward, as it is a molecule simulator that uses a VR interface to allow users to see and manipulate molecular, protein and atomic structures in a 3D space. Funakawa is also an award-winning filmmaker, with his film “Foliage: Roots of the Tree Barrel” which won the grand prize at the 2014 Hawaii International Film Festival student showcase. He became interested in virtual reality while working as the assistant curator for the UC San Diego Student Film Festival. The BEARLs award ceremony at 5 p.m. on April 9 at Atkinson Hall will feature red carpet arrivals, “mocktails,” and live performances. The campus community members honored at the awards will be recognized for their contributions in the five following categories: rejecting acts of discrimination, championing freedom of expression, celebrating all culture, resolving conflict constructively and promoting individuality. The tradition has grown since its inception in 2017. This year, there were nearly 100 nominations from the campus community representing contributions by undergraduate and graduate students, as well as faculty and staff. There will also be a posthumous “BEARL” award given to UCPD officer Mike Britton, who made important interventions around campus sexual assault and passed away last November after battling cancer. 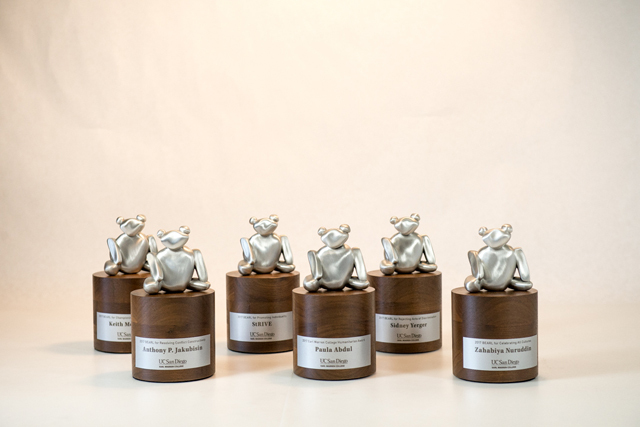 For more information about the "BEARLs" awards, click here.